Copies of Paul's mono prints (pictures from which a limited of only one was produced) have now been added to the gallery. As ever, any information about the pictures, or details of originals which have not yet made it to the gallery would be greatly appreciated. In a long overdue update, the rest of Paul's 2009 releases have been added to the site along with all of the 2010 releases. The owner of a fantastic original, The Teaparty, has submitted their image to gallery and it has now been added for everyone's pleasure. The rest of Paul's 2008 releases have also been added to the site along with his first set of 2009 releases. A new original, Whirligigs, has been submitted to the site and has now been added to the gallery for everyone's enjoyment; Paul's two sets of 2008 releases (Spring and Summer) have also been added to the site. Paul's 2007 Christmas release, When you need a special friend, has been added to the online gallery. The eight new limited edition releases and two new sculptures from November 2007 have been added to the gallery. The new limited edition releases from December 2006 have been added, along with the February 2007 releases. A new original, Under the Stars, has been submitted and added to the online gallery. The Discussion Forum has been removed from this site for two reasons, firstly due to a massive amount of spamming, and secondly as there seems to have been little interest in discussing Paul's work over the past twelve months. If you feel strongly about this, please let us know, and we will explore alternative solutions. A guide to Photographing Framed Pictures with information from a professional photographer has been added to the Links sections of the site. A new original, A Hard Days Work, has been submitted and duly added to the online gallery. Four new limited edition prints have been released this month and added to the gallery: A Better Life, Gift of Love which introduces a new character, On Rainbow Days, and in this World Cup season The Magic of the Cup. Three new originals, Someone Knocking at my Door and the designs for the After the Day is Done plate and vase set (After the Day is Done and The Call of Home) have been added to the gallery. These originals are all being offered for sale; interested purchasers can get in touch with the seller directly. Paul's Spring 2006 releases, Together as One and House of Secrets, have been added to the gallery. A new original, In a World of Dreams, has been sent to be added to the gallery. The current owner is selling the picture through Yarm Gallery, or can be contacted directly by e-mail. Alongside Paul Horton, John D Wilson is another of my favourite artists, and I have started collecting his pictures to build an online gallery for everyone's delight. 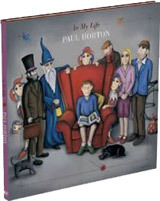 As he has not published so much yet, this is now available at http://www.paulhorton.org.uk/johnwilson. Part of the amusement of John's work is the inclusion of 'old masters' (and some more contemporary artists including Paul Horton: here and here), and I am keen to try and identify all of these. To this end, I have created a new forum with a thread per picture, so if you could contribute, please do so here. Thanks! Six new originals have been sent to me for inclusion in the gallery: Life on the Road, A New Start, Having a Rest, Walking Home, Something Special, and Man Against Time. Sadly the current owner is obliged to part with them, and is selling them through White Fine Art. The unofficial Paul Horton gallery has finally moved to its own home and shining new domain (www.paulhorton.org.uk). As part of the move it has been given a lick of paint and generally tidied up a bit. I hope that people like the new look and find the site as easy and fun to use as its original incarnation. I am looking forward to seeing some more discussions taking place in the forum as it is a great place to meet other fans of Paul's work. There is also the addition of one new picture, Paul's other Christmas 2005 release, Winter Wishes, which has only recently been drawn to my attention. The timed release for the BBC 2005 Children in Need appeal, Here for You, has resulted in a run of 391 limited edition prints. Paul's Christmas release, Man of Snow has been added to the site, along with another original, As Love Grows featuring Scruff, which was submitted by its generous owner. As this site is now just over a year old (it first appeared online in December 2004) all that remains to do for 2005 is to thank all of our visitors for their continued interest and support of the site, and to wish everyone a very happy christmas and prosperous new year. Five new categories have been added to the gallery covering Paul's most recent releases: Billy the Bear, Ollie the Clown, Daisy, Childhood Nostalgia, and miniatures. These new pictures indicate a move away from Paul's trademark characters and hold much promise for his future work. I have finally set up a forum for users of the site to discuss Paul's work, it can be found at http://forum.paulhorton.org.uk; I hope there will be some lively discussions about Paul's work and that people enjoy the opportunity to communicate with other fans of his work. The addition of the forum is also the start of the development of this site which will eventually be moving to a new home as and when time allows. For the first time, twelve of Paul's images have been published as a calendar for 2006; this is currently available to buy from amazon.co.uk for a remarkably reasonable �6.99. Another unpublished original has been added to the galleries: Walking the Dog. Many thanks to the owner for getting in touch to share this with a wider audience. If there are any more originals that owners would like to include in the gallery, please get in touch as I know there are many people who would love to see more of Paul's work. I hope this area of the site will grow in time as it is fascinating to see works that are otherwise unavailable. Two more unpublished originals have been added to the galleries: The Jester, and Chester - A Study. A great new gallery of Unpublished Originals has now been added to the site. The images have come directly from the current owners of the pieces, and it is amazingly kind of them to have shared them with a wider public. The fantastic new images from Paul's 2005 tour In My Life have been added to the relevant galleries. Paul's Valentine's Day release, Lovers Lane, has been added to the gallery. Paul's new release for this Christmas, On a Magical Winters Eve, has been added to the gallery. Initial launch of the web site. As it stands today the web site fulfils all of its original aims: it makes all of Paul Horton's published work viewable in a single place and provides information about the pictures in an easily accessible form. However, as with anything, there are several improvements that are planned such as providing more information on the collections of works, giving a more detailed description of each picture, creating a searchable index to the work - this list could, and does, go on but as time allows the it will diminish. In the meantime, I hope that you enjoy Paul's work as much as I do and find the web site provides a useful resource.